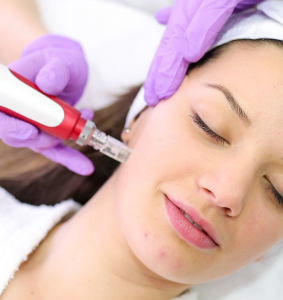 Microneedling rejuvenation is also known as collagen induction therapy. This new technology involves the use of tiny needles creating micro-wounds on the surface of the skin. The procedure stimulates the rejuvenation process through the production of collagen and tightening of the skin. Depth of the needling process depends on the treatment target, acne scars and stretch marks require a slightly deeper treatment than pores and fine wrinkles. Fine channels made in the skin via the Microneedling process give direct access to deeper layers of skin from the surface. These direct access channels allow our consultants to transdermally deliver 80% more nutrients than topical methods, to feed cells found in the dermis and basal layer of the epidermis. Additionally, the micro-punctures in the skin stimulate the body’s natural response by launching processes to repair the physical damage. The result is an increased production of normal woven collagen. The results are reliant on your body’s natural healing response. For best results 4 to 6 treatments should be received over a 3 to 6 month timeframe. Microneedling is not considered painful. Discomfort is generally minimal.